Nadine Bernard Westcott has illustrated numerous books for children, including "How to Grow a Picket Fence" by Mary Louise Cuneo and two popular children's songs: "There's a Hole in the Bucket" and "Over the River and Through the Wood". She has also illustrated another book in the Let's-Read-and-Find-Out Science series: I Can Tell by Touching by Carolyn Otto. Ms Westcott lives on Nantucket Island in Massachusetts. 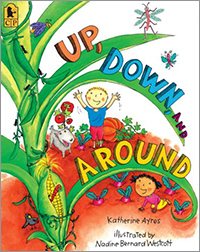 From seeds dropping into soil to corn bursting from its stalks, from children chasing butterflies to ants burrowing underground, everything in this vibrant picture book pulses with life—in all directions! Sprightly illustrations set the mood for a rhythmic text that follows nature’s course to a feast of backyard bounty. Join Nellie and Gus and their family—plus all manner of other families—for a day at the zoo, where they see animal families galore! To top off their day, Nellie and Gus invite friends and relatives for a fun dinner at home. 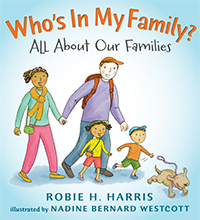 Accessible, humorous, and full of charming illustrations depicting families of many configurations, this engaging story interweaves conversations between the siblings and a matter-of-fact text, making it clear to every child that whoever makes up your family, it is perfectly normal—and totally wonderful.